JOIN US TONIGHT, APRIL 9TH! 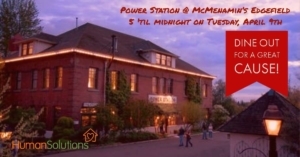 We hope you’ll grab a bite to eat with us tonight (Tuesday, April 9th) at McMenamins’ Power Station Pub @ Edgefield. All are welcome, including kids! 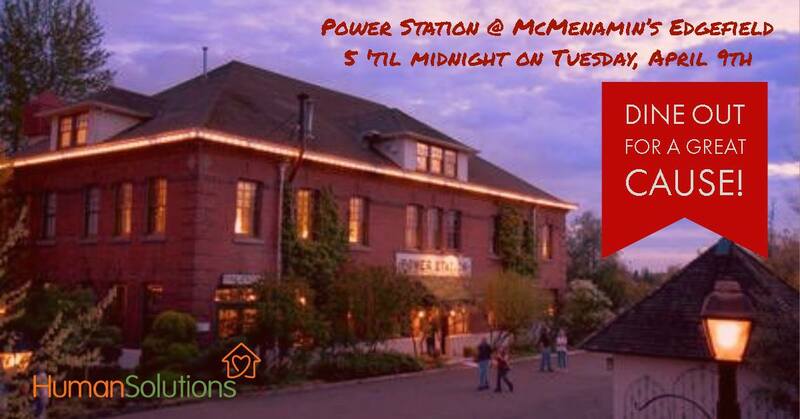 McMenamins will generously donate 50% of the evening’s proceeds to Human Solutions (thank you, McMenamins!). What a fun way to support a good cause! Human Solutions' management and staff will be there to welcome and visit with supporters. We hope you can make it! The Fair Housing Council's 2019 Poster Contest winner. Created by student Jaytee Franko. 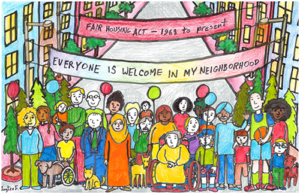 April is Fair Housing Month, and our partners at the Fair Housing Council of Oregon deserve a big shout out for the work they do every month to ensure that every Oregonian is treated fairly when they seek housing. The Council tells us that they are frequently asked, “Is discrimination really still a problem?" Their resounding answer to this question is “YES!” We invite you to take a spin around the Council’s informative web site to familiarize yourself with the law and how unlawful housing discrimination continues to impact Oregonians. If you have a question or a complaint related to illegal housing discrimination, call (800) 424-3247 ext. 2.The Fair Housing Council offers phone support in whatever language you need. The Council offers information and services for individuals and for folks in the housing industry to help them comply with the law. 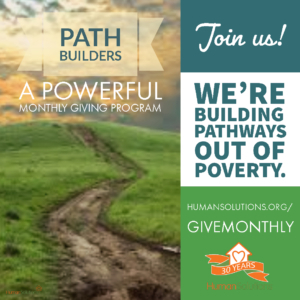 Half of the people we work with in this program come to us with no income at all (and some lack housing, which we help them with). The success rate is pretty impressive, with an average annual income boost of $15,000 and a 365% return on investment over a 6-year period. We’re grateful to the City of Gresham for the support they provide for this work. WORK WITH US! WE’RE HIRING. 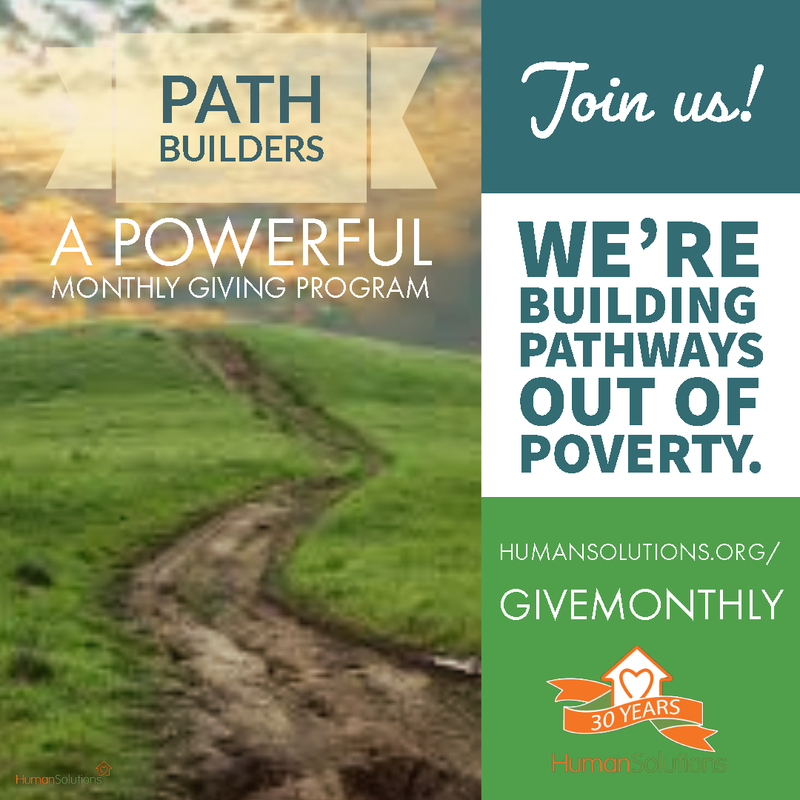 Human Solutions is a rewarding place to work. We’re hiring for a range of positions right now and encourage you to see if there might be a good fit for you or a friend. Take a look and spread the word! 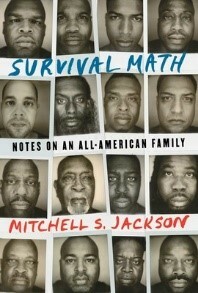 Mitchell S. Jackson has a new book out. The topic he tackles, growing up black in Portland (not Portlandia, as he says) couldn’t be more relevant to the housing crisis and the way some people are more impacted than others – and always have been. Oregon Public Broadcasting recently shared a fascinating conversation with Mitchell as he and the host of “Think Out Loud” walked the streets of Mitchell’s childhood; a place where the show host now lives. You can listen here – and the book is available from our local library, which offers paper and e-reader versions. For a national and historical perspective on racism in Portland, this Atlantic article from 2016 remains relevant. Thank you for reading – and especially for caring about those in our community experiencing the devastating impacts of poverty and homelessness and wanting to change the broken policies that cause them.